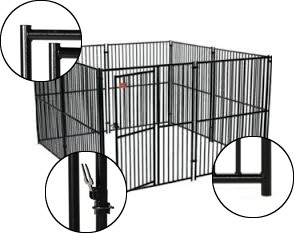 Our Euro Series kennels are composed of modular wall and gate panels. Most basic configurations consist of one gate panel and a series of wall panels, although the configuration options are nearly endless. Each panel connects to its adjacent panel in just minutes using 2 sturdy steel clamps and nothing more than a simple wrench. The panels can be disassembled, moved, and reassembled in the same or a different configuration at any time. Adding on to a modular kennel is simple too - just buy more panels. Modular kennels are the ultimate in versatility, expandability, and cost-effectiveness. Heavy duty upright tubing spaced at 2 1/2", stronger than even our 8 gauge welded wire mesh!